After two weeks with the new Kindle 2 eBook by Amazon.com I can confirm the Kindle 2 is a simple, but extremely useful device that really does change the way you acquire and read books, magazines and newspapers. The Kindle 2 has many things going for it, but does it convince us to "go digital" with our reading? Is it worth that price tag? Read on to find out. 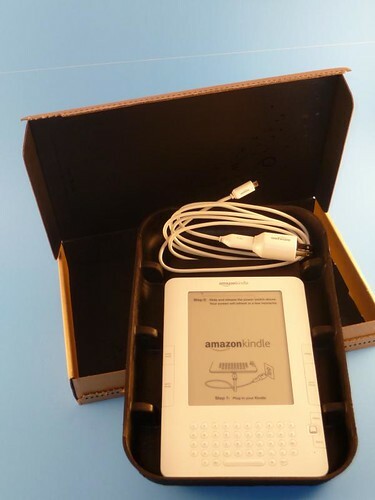 By now you've likely heard of the Kindle and now the Kindle 2, the heralded eBook by Amazon.com. When the second chapter in the Kindle story, the Kindle 2 was officially announced, I was more than curious. I hesitated at first, but after thinking about it decided the Kindle 2 was another move towards the digital media world that GeekTonic is all about and it was time to delve into those digital pages and see what the Kindle was all about. Note to Readers: This is the first of two Kindle 2 reviews on GeekTonic. This review is from the perspective of a true gadget geek, me. I read newspapers and magazines daily, books on occasion (although more on vacation and weekends than during work-weeks) and lately I read blogs and articles on the web constantly. I am first and foremost a gadget geek who is fascinated by digital media gadgets. Next up is a review by a hard-core reader, regular person (read: not a geek, but very technologically capable) who always has one or two books she's reading. This Kindle 2 we're reviewing is one we purchased for ourselves for the full price of the device so expect a very unbiased review as you'll always find at GeekTonic. Getting Past the Kindle "Stumblers"
Cost - There is definitely a segment of the population that can drop $359 on a Kindle 2 and then $30 for a case to protect it, but it takes a certain kind of person to be able to do that especially in this economy. It's not paper. Let's face it. Most of us are so used to paper books, magazines and newspapers that moving to an eBook is a tough thing to get your head around. You have to charge that book? Yep, going from that simple, paper book to an electronic reader means you need to charge that thing occasionally. And that is a turnoff for some. Sharing - Have you ever borrowed a book from a friend or relative? Ever checked a book out from the library? Not quite as easy to do with an eBook. 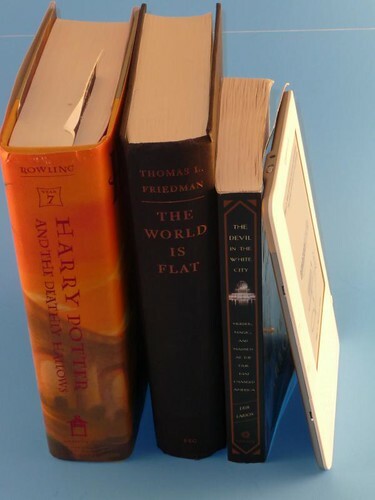 Many non-Kindle owners might have some of these same reservations about the eBook reader, but it's important to understand what the eBook reader is up against before we get started. Even if you're deadset against the eBook concept and/or the Kindle 2 in it's current form, I encourage you to read on. There's so much good to say about the Kindle 2 I think you'll be pleasantly surprised. Now that we have that out of the way, lets delve into the meat of the review shall we? Looks - Is the Kindle 2 Attractive? If you've seen the original Kindle, you likely considered it somewhat awkward and almost clunky. 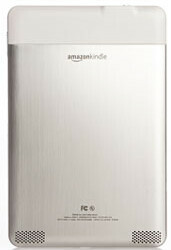 This new Kindle 2 comes across as more sleek with its rounded corners, extremely thin body and brushed metal backing. Yes it's still mostly white and still has a keyboard at the bottom, but it just looks better than the Kindle 1 in all aspects. Put it next to a Sony eBook reader and it shines in comparison (something I couldn't have said about the Kindle 1). It looks sleek, yet simple and is perfect for a form-factor of an eBook. Above is a look at the underside of the Kindle 2. The Kindle is thin - .6 cm on the edge (less than the iPhone). It's light and thin enough to slip into a messenger bag, a large jacket pocket or even a small purse. The screen-size is the same as on the Kindle 1, but the layout and spacing around the screen makes it much more comfortable to hold. The next page and previous page buttons are in the perfect spot for holding the Kindle one-handed on either side, although a next-page button near the bottom would be useful for those who prefer to hold a book from the bottom. No accidental page turns on this one as the buttons were redesigned to push from the inside edge instead of the outside edge. The Kindle 2 is extremely comfortable to hold during long readings one-handed or two handed. I've used it over the past two weeks and can tell you I would prefer holding that Kindle 2 for longer reads then I would a hardcover or even a paperback book, it's just that simple. There are a couple of very important buttons on the Kindle 2 - ones that are far more important than the alpha numeric keys. Next Page - There is a "next page" key on the right and left-hand side of the screen. As you can imagine, you'll use these keys often. These keys are about 1 1/2 inches long and placed perfectly on the Kindle 2. Previous Page - The "previous page" button does just what you'd expect, take you back one page in the book or periodical. Kindle 1 owners will note that the Kindle 2 doesn't have a previous page button on the right-hand side like the 1st generation Kindle did. I would have preferred they left that button on both sides, but it's really not as big of a deal on the Kindle 2 since you don't have those annoying accidental page turns on this Kindle 2 like you saw with the Kindle 1. On/Off Slider - On the very top-edge of the Kindle 2 you'll find a slider button that puts the Kindle to sleep (leaving a random book cover on the screen), turns the device completely off with a longer "slide" and turns it back on. This is a huge improvement over the Kindle 1 as you can turn it off and on even in the dark since you no longer need to press a combination of keyboard buttons. Home - The home button takes you to the main menu page of the Kindle where your books and periodicals are listed. Five-way key - this is like a joystick where you move the cursor around for menus up, down, left and right and highlight a certain word or item in a book. When you press down on this key it works like an "enter" key to select an item. I remember the first time I saw the original Kindle. The Kindle 2 still has a keyboard, but thee keys look more natural, are spaced out better and are very functional. They keyboard is used for input of search text, shopping for books and periodicals, web page browsing etc. The buttons have a solid feel to them and key-presses seem very responsive. While the slower page turning on the Kindle 1 seemed to be an issue for a few, the Kindle 2 should not present this problem. Amazon is claiming that the page turns are about 20% faster then on the Kindle 1. I've timed a bunch of page turns and it seems to take about one second to turn a page. So unless your speed reading is beyond light-speed, the Kindle 2 should be perfectly fast enough. Okay so we've covered the look and "feel" of the Kindle 2. So how easy is it to read? The Kindle uses an electronic inc technology that makes the screen much more like viewing a paper document. The screen reflects light very much like paper which means it is easy on the eyes (unlike a laptop or iPhone) during long readings and it means it doesn't suffer from the glare from sunlight like you get with a LCD screen. 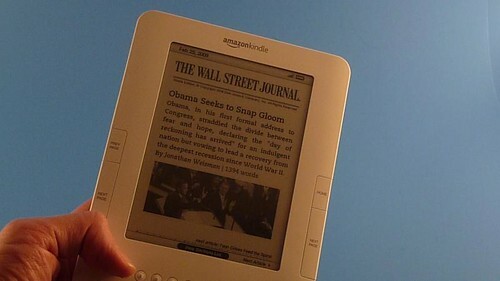 This technology also means the Kindle 2 uses much less power to display that page. Most of the energy usage is for the initial page generation, page changes and wireless connectivity. More on that later. The screen size and resolution is exactly the same as on the Kindle 1 but improves to 16 gray scale tones which improves the reading and viewing of images. I think the text looked pretty good on the Kindle 1 and the improvement on the Kindle 2 is there and looks at least as good as on paper if not better. Where you'll notice the most improvement from the additional gray scale tones is with illustrations, charts etc. And this of course will be important if you read any books, magazines or webpages on your Kindle 2. 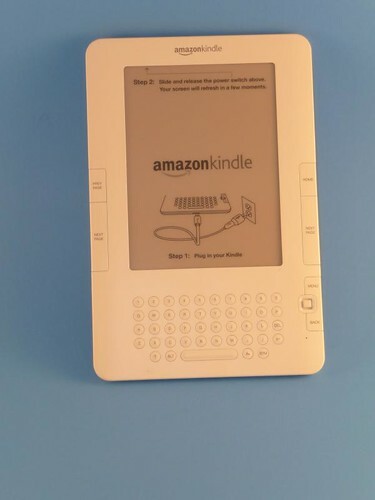 Just as with the Kindle 1, the Kindle 2 has a monochromatic screen which means only black and white. This won't matter to most book readers, but if you are into the photos or illustrations on picture books, magazines, newspapers or web pages this is something to remember. If you are a hard-core reader the Kindle is really a nearly perfect device for you. Reading books is what the Kindle 2 does best and being able to pack in so many books in a single, tiny device makes it really appealing for the avid reader who also travels or commutes very much. Packing my Anathem book in my backpack adds quite a bit of weight and bulk to my load, but on the Kindle, it's small and lightweight - and I'll never lose my place either. My wife's "avid reader" review will go into the basic Kindle experience from her perspective, but I can tell you that the person who reads very much will come away impressed after holding and using the Kindle for very long. Me being a self-proclaimed "geek" means I'm very accustomed to reading a lot on LCD screens, iPhone and Blackberry devices. While its certainly convenient to read on all of those devices, nothing comes close to the experience of reading on real paper except for the Kindle 2 reader. It's easy on the eyes, very easy to read text and as close to reading a paper book as you can get. I'm a heavy newspaper reader. I read my local newspaper (Kansas City Star) daily and for work I read the Wall Street Journal. So I was very curious to see how well the newspaper experience was translated to the Kindle 2 eBook format. I was really pleasantly surprised by how easy it was to read a newspaper like the Wall Street Journal on the Kindle 2. Navigation of the newspaper was a concern since the WSJ has tons of articles in each section, but the new Kindle 2 navigation makes it much easier. Is it as good as reading the traditional paper? Definitely not - the newspaper is large and meant for quick scanning of headlines and articles. The Kindle 2 makes it pretty easy, but not as easy as the good old newspaper. That being said, I LOVED getting that newspaper delivered to my Kindle in the early hours of the morning. When I wake up and turn on the Kindle the paper is right there ready to read - no wet newspaper, no delay and I have it delivered to my Kindle no matter where I am be it on vacation, on a business trip or wherever. This convenience is a nice advantage of the Kindle 2. A few other nice advantages for newspapers on the Kindle include the text-to-speech feature (see the next section of this review) and the search and annotation feature. One of the highly touted, new features they added to the Kindle 2 is the text-to-speech feature. In general I liked this feature for short periods - mostly to listen to a newspaper, but also to continue listening to a book I've been reading when I just couldn't read it (on the way to work or getting ready in the morning) in the traditional sense. There is a male and female reading voice and both are quite good. It's not like an audiobook by any means and I wouldn't listen to a whole book that way, but it is a useful feature. If you'd like to hear what it sounds like, check out this post with a video of the text-to-speech function. As previously noted Amazon has decided to appease the publishers & writers and allow them to decide whether to enable or disable the text-to-speech feature for given books. Read more about this unfortunate news here. Navigation with the Kindle 2 is mostly easy and intuitive. I say mostly because there are a few little tricks to the navigation that you either have to figure out or find out in the manual (or by reading here). The front page lists out all of your books, periodicals and items added sorted by most recent by default. 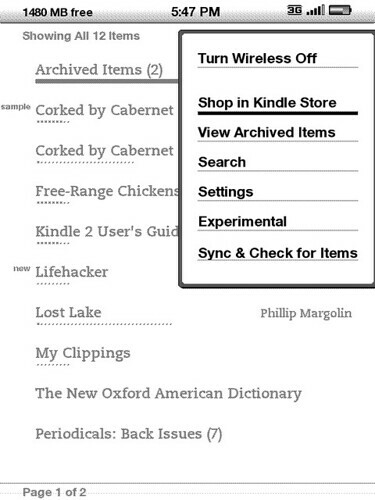 Then using the right toggle button to toggle between the sort options: "most recent first", "Title", and "Author"
You can also use the 5-way button to move the cursor to the left and select "personal docs", "subscriptions", "books" and 'all my items"
One of the big complaints about the Kindle 1 was the lack of a way to sort items into folders. Amazon touts that the Kindle 2 can hold over 1,000 books on the device, but imagine sifting through even 200 or so books when there is no way to create folders and move books to and from the folders. This is something I would think Amazon could have added by firmware update - even on the Kindle 1, but hasn't done so. Lets hope they change this soon. Another thing they could do is add some sort of meta-tags or genre tags to help in the sorting and navigation. If they really want us to hold that many books and periodicals on the Kindle, they must add some of these features to make it easier to manage that many items. Something those totally new to the Kindle might take for granted, but Kindle 1 owners will be impressed with is the five-way toggle button (up, down, left, right and enter). This button is very efficient and easy to figure out and the search, lookup and annotate features of the Kindle 2 really show off how easy this is with the five-way toggle button. You can also do a quick lookup of a word as you're reading? Simply move the cursor over that word with the 5-way toggle (yes the exact word - not the entire line as with the Kindle 1) and while the cursor is over any word, the dictionary entry shows at the very bottom of the screen instantly. Pressing enter on the 5-way toggle brings up a more detailed dictionary entry. Pretty cool - even for this geek. If you're a reader who likes to learn new words from the books or newspapers you read, this is a great way to do it. And better yet, you can clip all of those searched words and save them for later. Want to make a note about a particular part of the book or bookmark your current place in the book? You can do that by pressing the "menu" button and then selecting either "add a note or highlight" or "add a bookmark". You can always access these bookmarks, highlights and annotations by again pressing the menu button on the Kindle. You can also access all of these saved bookmarks, highlights and annotations compiled together when you synch up your Kindle to your computer with the USB cable. This could be useful for the person doing research on a book or just wanting to remember their notes they made about a book or passage in a book. The Kindle 2 has 2GB of storage although mine shows approximately 1.46 GB of available storage before putting anything else on it after it arrived. This is a huge improvement over the Kindle 1 which had 256 MB of internal memory and an SD card slot for expansion. The battery on the Kindle 2 (3.7V, 1530mAh lithium polymer, BA1001 model) is much improved over the Kindle 1 battery battery life seems to be very good. Leaving the wireless on with fairly heavy use, the Kindle 2 has proved to last several (more than 4 days) without charging. If you use the text-to-speech feature it seems to drain the battery a bit faster but you definitely could make it longer than a day without charging. You can charge the Kindle 2 with the included mini-USB to USB cable which includes an AC plug attachment. With that same cable you can charge from a computer or from AC. The big disadvantage of the new battery is this: the Kindle 2 battery is built-in and not replaceable so after a few years I can see it's battery life will probably degrade. You can connect your Kindle to your computer and browse the files on the Kindle from your computer's file browser. In there you'll see the book and periodical files, screen-shots you've saved, clippings bookmarks and annotations, audio files and photo files. Transfer via the USB tether is fast and you can charge from the USB cord as well. The Kindle 2 comes with no backlight or sidelight for viewing in dark conditions. So you'll need a booklight if you're planning to read in the dark. I picked up the Mighty Bright XtraFlex2 Clip-On Light for $12.99 which fits on the Kindle 2 fairly well and makes reading on the Kindle in the dark much easier. It would be nice if the Kindle had some way to light up the screen built-in. You might be surprised (or maybe not) to know that 12 of the top 20 Bestsellers for the Kindle on the Amazon.com Kindle store are all available for free on the Kindle. Many of them have pretty good reviews so I'm guessing like many others, these are some books Kindle users are trying out on the Kindle or just stock-piling while they can get the books for free. There are many other places to get books besides the Amazon store, but I'll save that for another GeekTonic post. I should note that while the Kindle store has a huge selection of Kindle books for sale, there are plenty that aren't available for the Kindle. A few notables that aren't available for the Kindle include: The Watchmen (#1 on Amazon's top sellers list right now) and all of the Harry Potter books. You can also subscribe to a selection of Blogs as well for around 99 cents to about $1.99 per month which supposedly covers the wireless delivery. I've subscribed to Lifehacker and a few others for the 14 day trial and it is convenient, but I think I'll stick with my laptop for blog viewing. The Kindle also has the capability to view basic mobile websites with a somewhat rudimentary web browser which I'll use once in a while, but for the most part, the laptop or iPhone is much better at handling web browsing. For this reason, I'm mostly ignoring the web features on the Kindle for purposes of this review. Any Kindle device with a single Amazon account can access purchased books and share with each other. Magazines and newspaper subscriptions are tied to a single device however. Sharing a kindle book with a friend or family member that has a Kindle (or iPhone for that matter) is not possible because they wouldn't be tied to the same Amazon account. This brings up another issue. Remember that old fashioned thing we call the library - you know the one where you can check out books for free? Well you won't be able to check out Kindle books there so your Kindle is pretty much helpless at the library. Let's face it - DRM is bad for the consumer. It creates all kind of ease of use issues and limits the value of your purchased materials. But it seems to be a necessary evil for the moment. Until there is enough competition for eBooks expect to see DRM as the norm on the Kindle and on competing eBook reader formats like we'll probably see from Barnes and Noble for instance. "Whispernet" is basically a Sprint EVDO, 3G wireless connection that feeds purchased items, updates the firmware and delivers your subscriptions to your Kindle 2 via the Amazon store. It makes purchasing & downloading new books, magazines and newspapers extremely fast and easy. Books we ordered via the Kindle and even on Amazon.com via a web browser all arrived on the Kindle, ready to read in less than a minute. You can delete an item from the Kindle and re-add it from the Amazon server at any time right from your Kindle. Remember that iPod Touch/iPhone Kindle app we talked about last week? With the iPhone Kindle application you can load your books on the iPhone as well and it allows you to read to a certain page on one device, pull it in to another Kindle or iPhone device and pick up right where you left off. A nifty feature for sure. Now, if you are loading items that weren't purchased from the Amazon store (we'll get into how that works in a future post on GeekTonic), you have to connect your Kindle to the computer using the USB cable since there's no longer a SD card slot on the Kindle 2. Not Available in Canada, Europe or other Non-U.S. locations - Yet. If you reside in Canada, Europe or pretty much anywhere other than the United States, you're out of luck. Thus far, the Kindle 2 isn't available to you. Rumors are bubbling that we'll see the Kindle in Canada and other non-U.S. locations soon though. Lightweight - this little Kindle is light (just over 10.2 ounces) and very easy to carry. It makes it much more mobile than even some paper books and that means I'm much more likely to add it to my backpack for short and long trips. Super-thin - its sleek and yes thin (just over 1/3 inch) like I like my electronic devices. Easy to hold with either hand - If I'm going to read a book, it must be easy to handle whether I'm reading on the couch, on the train, in bed or wherever. The Kindle 2 is up to the task and is very easy to handle while reading. Whispernet (EVDO wireless) - purchasing and archiving books is fast and easy. Instant Access to the Bookstore and Newspaper Stand Anywhere you go - I have to say, having the ability to purchase a book, newspaper or magazine wherever you are in an instant is almost addictive. Did you just finish book one in a three-book series and want to start the next one NOW? The wireless delivery system makes this possible and this sort of access makes the device very appealing to the traveler and even those in rural areas without quick access to the bookstore. Display is great - the electronic ink display of the Kindle 2 is excellent. Easy on the eyes, very low glare and fast refreshing pages make it a joy to read on. Very good battery life - We were able to use the Kindle extensively for several days without needing to charge it - that was even with the wireless turned on. Excellent build quality - This thing looks and feels solid. Buttons are tight and the thing just feels solid. Instant Font Changing - I hadn't used the quick font changing function on the Kindle 2 all that much until I showed it off to my retired parents. They were delighted to see that you could increase the font size with a key-press and have an instant large-print book or newspaper for those times when they wanted it. Text-to-Speech - A nice-to-have feature. Price - Plain and simple, the $359 cost of the Kindle 2 without a case/cover is just too steep for the majority of consumers. Lower this price closer to $100 or $150 and you have yourself a hugely popular eReader. No expansion card - Not as big of a deal as I expected, but something Kindle 1 owners would miss with the Kindle 2. No replaceable battery - Well, this has its positives (no clunky battery door) and negatives, but as with the iPod, it sure would be nice to be able to replace that battery down the road. Shopping Around for non-Amazon content isn't Easy - Before I go into what I mean here, let me say this - I love Amazon.com. I shop there often for all types of physical items and prefer their DRM-free music to iTunes for instance. Further, their Kindle book selection is pretty darn good. But I'm somehow a little uncomfortable thinking I have to get all Kindle books from a single company. It's almost like saying I'd have to purchase all digital music for my iPod from iTunes. Convenient? yes, but not necessarily always the best thing. The Kindle 2 is a significant evolutionary step up from the Kindle 1. If you're a Kindle 1 owner I'm not sure it would be worth it to upgrade although it does offer some decent new features and improvements. But for the person entirely new to eBooks with the necessary cash to spend on a eBook reader, the Kindle 2 is something you really should consider. We've tried to show off the Kindle to as many people as we can over the past few weeks including high school teachers and students, my retired parents and many others. In general the reaction has always been one of pleasant surprise. I think most of the younger people who've seen it were the most interested - probably because they are more comfortable with using technology in new ways, but my parents both of which are retirement age and read books and newspapers daily were extremely interested in the Kindle2. I think the positives I've listed above are significant and far outweigh all negatives except for the price. Unfortunately the high price makes this device something of a luxury item for most people and that means its reach is far less then it could be. For the gadget lover who reads often and has the cash, I recommend this highly. For the reader who tends to pick up a book daily and goes through quite a few books in a year I recommend it to them as well - but the price keeps me from making it a must buy. Instead it's a must consider and for many people a device I would keep my eye on for the future. It's only a matter of time before we see a cheaper and probably even better eReader come out that really does radically change the way we all read. You can purchase your own Kindle 2 eBook Reader at Amazon.com . It currently sells for $359 with free shipping. Let me know in the comments what you think of this new version of the Kindle. Would you buy one at some price? Do you already have one? Any questions you have? NOTE: Many of the observations and comments used in the review above were a collaborative effort between my lovely wife Shelly and I. Next up is a quick, but useful review of the Kindle 2 from the perspective of an avid reader - in this case my wife. Shelly bypasses all the technical jargon and gadget love that I give the Kindle and focuses on the most important aspect for the hard-core book readers out there. Stay tuned for that review coming later today.